Put the world on your wrist with the Moto 360 Smartwatch by Motorola. This watch, which comes with a 23mm light finish stainless steel bracelet, runs on the Android Wear operating system and connects to your Android smartphone via Bluetooth to give you the information you need, when you need to see it, and displays it before you ask. Its 1.56" touchscreen shows "cards" of important info like text messages, emails, missed calls, weather, navigation, and more, as well as app notifications that can be configured via the free Android Wear smartphone app. It alerts you with a gentle buzz on your wrist, so you can quickly glance at your Moto 360 to see the new card. The Moto 360 is always waiting to hear from you, and can be voice-controlled without pressing a button. Simply say, "OK, Google" or touch anywhere on the watch screen and speak to operate your watch. You can get answers to questions, like "What's my next appointment? ", "How do I navigate home? ", "Where are nearby coffee places? ", or "How tall is the Eiffel Tower?". You can also ask your Moto 360 to complete actions, such as sending text messages, taking notes, scheduling meetings, and opening an app. Moto Body is a built-in activity tracker, designed to inspire a healthier lifestyle. It features a pedometer to keep track of your movement and an optical heart rate monitor, which constantly monitors your heart rate and lets you see how much time you've spent in various heart rate zones. When not showing a card, the Moto 360 takes advantage of its round screen and displays the time, just like a traditional watch. You can tailor the watch function to your style and mood by selecting from one of a variety of pre-loaded watch faces, or customize your own to add a personal touch. Bluetooth 4.0 Low Energy allows your phone and Moto 360 to stay connected throughout the day, while minimizing impact on battery life. Battery status: Shows the watch's charge level, and notifies you when you need to charge the watch's battery. Lost watch locator: Use your phone to find your lost watch. Motorola Connect opens a map showing the watch's last known location, and pings the watch if it's nearby and turned on. Lost phone locator: Use your watch to find your lost phone. The phone rings so you can find it. Device info: See details about your watch, including device name, battery charge level, MAC address, original name, and firmware version. You can also use this feature to rename your watch. OTA delivery: Automatically send device updates to your watch via your phone. Change watch faces: Use Motorola Connect to change the watch face on your Moto 360 watch. The Moto 360 has an IP67 rating, which means that it is fully dustproof and can be immersed in up to 3.3' (1m) of water for up to 30 minutes. Box Dimensions (LxWxH) 5.197 x 5.118 x 3.15"
Moto 360 Smartwatch (Light Finish, Light Stainless Steel Band, Regular Fit) is rated 4.6 out of 5 by 58. Rated 5 out of 5 by Will the techy guy from A revolution in Smart technology This was a great watch and I am obsessed with watches. I wear them everyday no matter where I go. So this was a prefect companion for my phone and me. I really love the round face and that it matched my previous watch. The battery last pretty long. It lasted two days for me because I had it on theater mode. The voice control was very nice and I used it often.The light sensor kind of ruined the face but it's understandable.Also sometimes I let it stay on, since it has a processor in there it will often heat up quick. Overall, this is a great watch for anyone looking for a great priced watch with many great features and a nice appearance. Rated 5 out of 5 by Creative Guru from A great watch, a great close out deal from B&H! This is my first smart watch. I bought my wife an iWatch last Christmas and was not very impressed. Sure, it does a lot like a mini version of your iPad but if it's a watch with simplicity you're looking for, the Moto is the way to go! It even works with both Android and iOS phones. My Moto gives me all my phone notifications. The Google Now voice recognition is amazing and it tells the time with a wide assortment of watch faces. The quality is great, it's very light and comfortable and I love the charger. Battery life is not the best but it lasts a full day. This was by far the best hundred bucks I've spent in a long time. Thanks B&H! Rated 4 out of 5 by KewlDood from Always remember your first...smartwatch So, it took two weeks and one day for the Motorola Moto360 to arrive after ordering from B&H for just under $100. The watch arrives with a single wireless charging cradle and some extra links for expanding the stainless steel watch band (more on this in a minute). After un-boxing, charging the phone is a simple task of plugging the micro usb cable into the charging cradle and the wall and putting the watch into the cradle. The watch charges fairly quickly. While it's charging, the time is displayed as well as a charging gauge. You can turn this off either temporarily by pressing the physical button twice, or permanently by unlocking the developer mode and disabling this feature. I've tried both methods to disable the always ON display screen while charging, and it hasn't worked for me. Pairing the watch to my Samsung Note 4 took two attempts. I've installed a multitude of watch faces from the Google Play store, along with several apps. I have a wink programmable power strip and have installed a couple of shortcuts on the watch to remotely turn a couple lamps on/off from the watch. The power strip is wi-fi, so I can control the lamps from anywhere. Be aware the Moto 360 does not have a speaker, and a VERY weak vibration. I've installed an app to adjust the speed, pattern and duration of the vibrations and it's hit-or-miss when it works. I've heard there's a defect with the new Android Wear version on the watch and phone that affects how notifications work on the watch. My Moto 360 does not seem to be one of those watches effected, but time will tell. When I put the watch on the first time, the band was snug, to say the least. I personally do not like a watch to be that tight, so I tried removing the pin that locks the links together. I didn't have the necessary tools to adjust the band, so I ordered an inexpensive watch repair kit before I could wear the watch comfortably. Is the watch perfect? No. The vibration needs to be more powerful. It would be nice to have a small speaker for the alarm and better battery management software would be appreciated. The watch screen is bright and clear, and responsive. I've had to perform a restart a couple of times when the watch seems to hang, and getting familiar with Android card system takes will take repeated use. I'm happy with my purchase, but I've only had the watch a week and a half at this point. Only time will tell how well the watch holds up (pun intended). 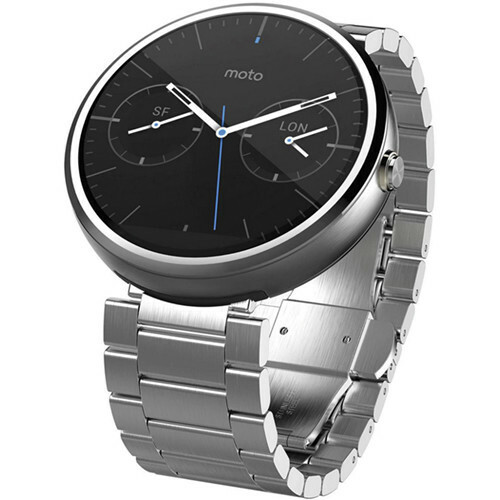 I've since recommended the Motorola Moto 360 to a co-worker who has ordered one from another vendor. It's a refurb, but cost $20 less than I paid. Hope this review helps. Rated 5 out of 5 by gordo1466 from Smart Watch is smart! Love it! What little I know how to do, works very well. I haven't learned very much yet. Tells me about things on my calendar well in advance, tells time well. Once I learn how, the speaking to it will be fun. I really like that it's round and doesn't look like I'm wearing a tablet on my wrist. My only complaint is battery life and I knew that before I bought it. Doing business with B & H was easy and a pleasure, as usual. Rated 5 out of 5 by Karate Kid from Great Smartwatch This watch is very stylish as well as functional. It doesn't look cheap like some of the other watches out there. So far, no complaints about the functionality. Rated 5 out of 5 by Anonymous from This is an awesome product! I really enjoy using this watch. For someone who is fairly new in the smart watch market, the moto 360 does the job nicely. The build quality feels very premium and is very comfortable to wear daily. The battery life is good as well. On a full charge, the battery always has at least 60% left after a full day. I would definitely recommend buying this watch! Rated 5 out of 5 by quangkhue from Cool watch! I was used to wear iPhone, but I recently switched to android phone. My wife bought this for me for my coming birthday. It seemed this is coincident when both are working well with android system. I really love it for many reasons. First is my birthday gift from my wife. Second is matched up with my phone. Third is very cool watch and it has a few functions that I like such as finding phone, weather, message or incoming phone call alert, etc. Last but not least is it fits my wrist -:). The only thing I really wanted more on this watch is longer life of battery. Yes. I have a cognac. I like that best. If I change my mind I may change it to black metal one. Will this work with the Amazon Fire phone and it's scaled down version of the Android operating system?Thank you. If you have an Android device to update the firmware, you can then make it work with an iPhone. It has limitations. No apps. Few watch faces. But the notifications all work. is it compatible to an apple device? No, this is only compatible with a device running Android 4.3 and up. Is this watch come brand new? When are my order going to ship off? Does it come in the original Moto 360 box?